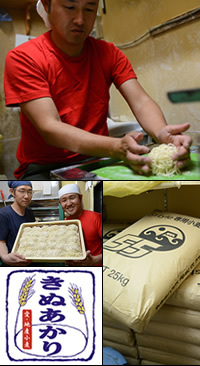 Thick homemade noodles that you are using to put all our noodles, because it does not use any additives should not be instead of noodles, such as humectants, preservatives Long shelf life because it does not, has painstakingly typed in the noodle room every morning. Basic materials, only the flour, potato flour brine (potato powder). Flour, you are using the flour of the nature of the middle of ramen and udon because I want out of a sense of the hips and sticky. By using the powder of potatoes produced in Hokkaido, but the Innovation vine out the throat. Eggs, buckwheat flour, so do not use, you can enjoy the peace of mind even more allergic to eggs, of buckwheat allergy. Additives because you are not using, and finished in natural flavor of homemade wheat noodles can be felt. Original enjoy homemade noodles healthy eating for children with confidence. Must be changed slightly depending on the formulation (temperature, humidity) daily weather. But noodles are great fun to make. Having made it more fun when delicious. This is the best part of artisan ramen! ! Has taken a large amount of broth with the onion. Be honest, flavor, flavor is coming out. Make yourself even though (even though it brought up) I wonder. There is sweetness of vegetables, but not salty dark color, there is a deep soup. Soup of the one and only not anywhere. Therefore have time-consuming soup such labor, so there is no way to mass. Soup is not going out the characteristics of the material. Rather than a soup of addition, subtraction soup is not exactly. Has been kept to a quantity of input does not protrude about animal system, the system seafood. So, it becomes a soup (onion) vegetables unique. It has become a mainstream industry in the flow of current, the system is well used form of seafood, and animal systems while out on the front combined with direct flavor of seafood, the flavor, the question seafood and pork bone soup so-called double is broken. Recently, also seen many shops that section to a powder system, directly into bowl. Because it is a thing to cherish the flavor of seafood, can be seen also many small shop warm in the pot, such as when the offer, provided by the state of fresh soup. 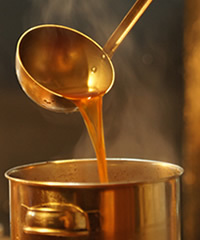 In addition, the shop is, and this is the opposite it is the idea at all, basically concatenating soup, broth and seasonings in advance in accordance with, such as soy sauce, but lay to some extent. Is, we provide a step by lay on its side, eliminating the corners of the soup, you will be mellow, deep came out to some extent. Actually, it have a color is dark soup, onion soup color is not aged as well as the color of soy sauce. So, we provide a flavor of seafood soup, not the state has been projected, all flavors, flavor is joined to. Ramen noodle soup Fujiyama 55 Osu wearing, of 55 Motoyama, and soup of blue-ya moment is different from 180 degrees above. A blue Ya moment, but taking the soup to be widely accepted until the elderly to five children at Sachi was relatively well to take a soup called “fish bone pig rich” you are now in fashion in the 55-Wonsan 55 Fujiyama you. Dense and become addicted. Such is the soup. Takes two days to finish the soup round. Day 1, increase cook over high heat pounding super center animal-based material. On the second day, cook over high heat and add the additional material of animal system, is completed flavored taste-section such as vegetables and dried bonito flavor Saba section in the finish. Animal system because it does not lose the broth concentration is high, the firm has asked them to carefully selected seafood soup, you have to finish some of the addictive nature of Japanese favorite soup. Soup can enjoy the flavor of seafood come Gattsun direct flavor of dashi animal system. Copyright © 2019 フジヤマ55 All rights Reserved.